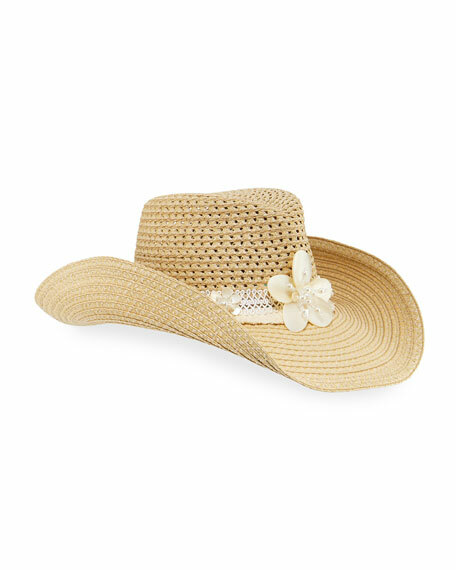 Western style hat of Squishee® with mother of pearl flower trim and cotton fringe adorning the crown. 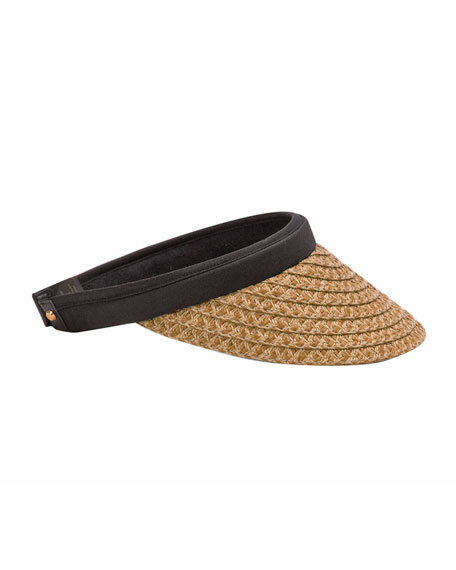 This vented straw style has a double faced brim which is 50+ UPF protective. Eric Javits "St. Tropez" woven bucket hat. Signature Squishee® materialman-made fibers that are woven to resemble straw but are more lightweight, flexible, and durableensure the hat looks good no matter what it goes through. Self hat band with hanging tassels. Elasticized inner band fits most. Eric Javits is known for his collections of inventive hats, handbags, and shoesall of which are designed to complement one another in a mix-and-match fashion. His designs are in the archives of the Metropolitan Museum of Art's Costume Institute, recognized for their uncompromising design and enduring style. For in-store inquiries, use sku #2465046. 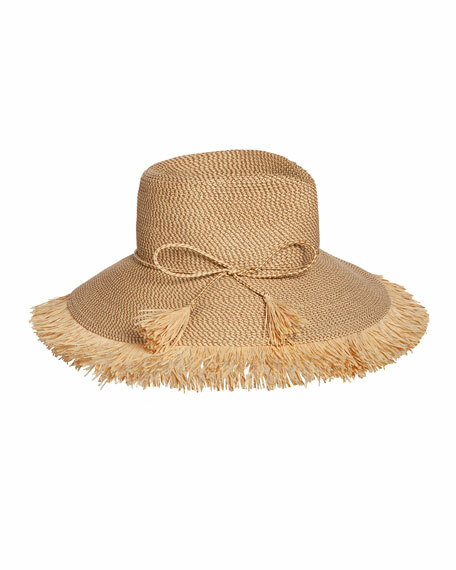 Eric Javits "Antigua" woven sun hat. Braided bow at hat break. Provides maximum sun protection for the face and neck. Pinched crown. 5.5"W downturn brim. Raffia fringe finish. Polypropylene/polyester. USA. 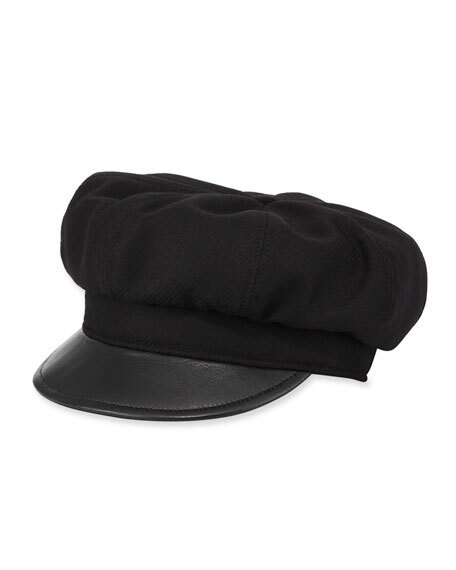 Eric Javits "Carnaby" wool newsboy hatinspired by the Carnaby Street caps of the swinging 60s. Faux leather curved visor brim (polyurethane). 2" peak. Made in USA of imported material. 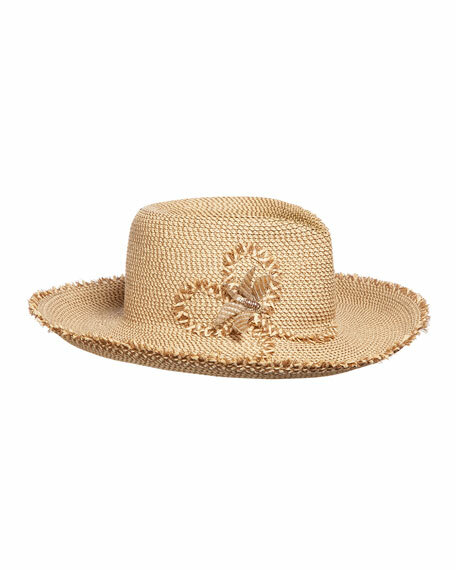 Eric Javits "Dragonfly" woven sun hat. Self heart and 3D dragonfly detail at break. Provides maximum sun protection for the face and neck. Pinched crown. 4"W slightly upturned brim. Polypropylene/polyester. USA.